How do I find out if a Solar Tracker will work at my home or business? If you are curious about a Solaflect PV Tracker for your home or business, please contact us to schedule a free site evaluation. During a site visit we will answer any questions you have, assess solar conditions, review the condition of your circuit breaker, and check for other aspects such as the presence of ledge that may affect the Tracker’s installation. The more sunlight that falls on the Tracker, the more productive it will be, and the more value you will receive from it. We use either a Solmetric SunEye or Solar Pathfinder to measure the “solar access” on your property. This is a measure of the percentage of open sky vs. trees/ridgelines/buildings/etc. that block sunlight at any particular location. More solar access means more sun for the Tracker. Here is an example of an image taken by the Solmetric SunEye. The image is taken with a fisheye lens, so the outer edge shows the level horizon, and the center of the image is the dome of the sky. You can see that the SunEye—which has built in GPS—has superimposed a curved grid. This grid covers the area of the sky where the sun will ever appear over the course of the entire year. The curved line closest to the top of the image is labeled as December, showing the path of the sun in that month. It is shorter from left to right than the other lines (the days are shorter in December here in the Northern hemisphere) and it is closer to the edge of the image (the sun in December does not rise very high above the horizon). Though unlabeled, the path in July is pretty much the same as that in May, August’s path is pretty much the same as April’s, September’s pretty much the same as March’s, and so on. The roughly vertical crossing lines represent the times of day, ignoring daylight savings time. So you can see that in December at this location, the sun rises at about 8 am and sets at about 4 pm. 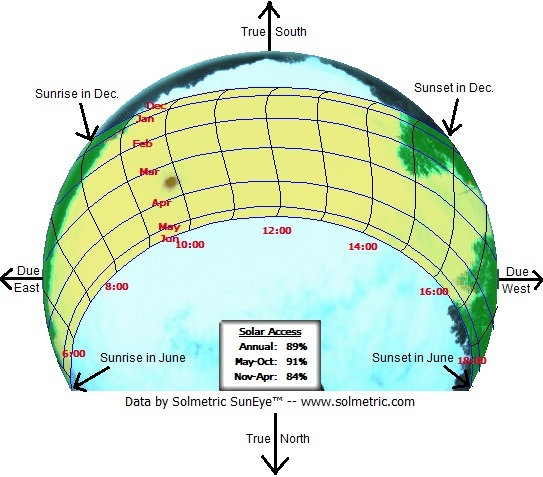 In June, sunrise is at about 5 am and sunset at about 7 pm. The SunEye analyzes the contrast in the image and superimposes color coding to indicate whether that part of the sky (where the sun travels) is open to view or obstructed. Where it is open, there is a yellowish tint. Where there are obstructions such as trees, there is a greenish tint. So, for example, while the sun rises in theory at about 8 am in December, at this particular location it won’t be visible above the treeline until 9 am, a loss of an hour of potential solar production each December morning. The SunEye then calculates the percentage of the grid area that is open vs. obstructed, and gives the result in terms of “solar access.” You can see in the image that this location worked out to have 89% solar access over the course of the year, with variations by season. 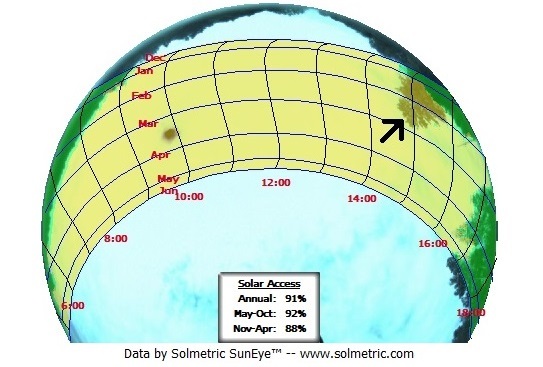 We can customize the SunEye analysis, for example to calculate what happens to solar access if one or more trees are removed. In the image below, we have “painted” sunlight over the tall pine tree in the northwest so that the SunEye will treat it as if it were an area of open sky. At this location, removing the pine would provide a gain of 2% additional solar access. With this solar access information, combined with data on average weather patterns (specifically, average cloudiness), we can calculate how much electrical production you should expect from a Tracker at your property. From there, we can determine the approximate savings you will see on your utility bill. All of this is included in the proposal that we send you shortly after the site visit. Armed with this information, you will be able to decide if it makes sense for you to go solar with a Solaflect PV Tracker. If you are comparing proposals from Solaflect and other solar installers, be sure to read our FAQ on how to properly compare different proposals so that you make an apples to apples comparison.